The beautifully crafted 13th century St. Giles Church (Kostel sv. Jilji) is situated in the heart of the Old Town, set amongst the narrow streets and quaint buildings in this enchanting area of Prague. Gothic on the outside and Baroque within, St. Giles is a grand church, its high ceilings adorned with ornate frescos. St. Giles Church was founded in 1238 by Bishop Jan IV, then remodelled by Dominican monks in 1340-1370, when it became the base of the religious reformer Milic of Kromeriz. Baroque elements added during the 18th century include the stuccoed interior by B. Spinetti and ceiling frescoes by V.V. Reiner. 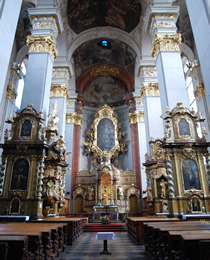 The main altar is breath-taking, adorned with polished gold relics centred around an image of the crucifixion. Throughout the church there are impressive marble spiral columns and intricate wood-carvings - most notable are four confession booths carved in the 18th century by R. Prachnerem. Extensive restoration work undertaken in recent years has brought out the finer details and vibrant colours built into the original design of the church. Works are paid for in part by visitors' contributions and the receipts from classical music concerts, which are held regularly here. The magnificent organ at St. Giles dates from 1737 and has rare historical value, with Baroque wood-carvings by F.I. Weise. It is the biggest classical organ in Prague, with 3500 reed-pipes. The unique acoustic quality of the organ is demonstrated during the concerts, which draw some of the finest organists in the country to perform all year round. The historical beauty of St. Giles Church also attracts film makers. Scenes from the film Amadeus, directed by Milos Forman, were filmed here. If you wish to attend a concert, even the benches you sit on date from around 1686. The concerts are popular, so it is wise to book in advance (and safe in the knowledge that by doing so you are contributing to the upkeep of this wonderful old church). For concert listings and to book tickets: Prague concerts.